The Cardinall’s Musick and Andrew Carwood continue their exploration of the sacred music of the acknowledged master of the Tudor era with this second disc of the music of Thomas Tallis. Tallis’s career spans the reigns of four radically different and difficult monarchs, all of whom forced their own religious beliefs on an increasingly divided country. Their various attitudes to the religious questions of the day meant that each required different liturgies and different music to adorn them. 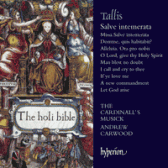 Tallis excelled in every style, and this album contains examples of each of them, from the monumental Marian votive antiphon ‘Salve intemerata virgo’ to the modest English-texted settings of ‘I call and cry to thee’ and of Psalm translations by Elizabeth I’s Archbishop, Matthew Parker.